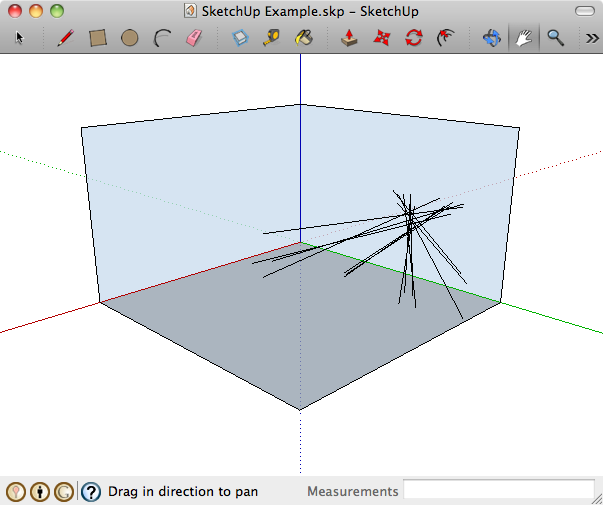 There is one post tagged sketchup. One of the formats my bloodstain pattern analysis software will export data to is COLLADA. COLLADA is an open format used to exchange 3D scene data between software packages. It is an XML format, meaning it’s readable in a text editor, but it is extremely verbose and not a simple thing to understand unless you know what you’re looking at [and even then…]. Before using it for my current work, I’d used COLLADA with an internal version of the Torque game engine at GarageGames, so I had some familiarity with the format before using it this time. SketchUp is a powerful free modelling tool from Google. As with any software importing COLLADA, some of the concepts in the format map to concepts within the software, while others do not. One of the things that was not obvious to me when I started exporting COLLADA files for use in Google SketchUp was how to set up my COLLADA so it had hierarchical components upon import. My scenes always showed up as one monolithic component which meant that modifying parts of it to add textures or colours was not easy. For the bloodstain analysis work, I only have to deal with simple scenes consisting of planar surfaces and lines.